Before I was a florist, I designed and maintained gardens. I still do that today. When the crush of wedding season ebbs, I love consulting with homeowners and helping them design or troubleshoot their gardens. 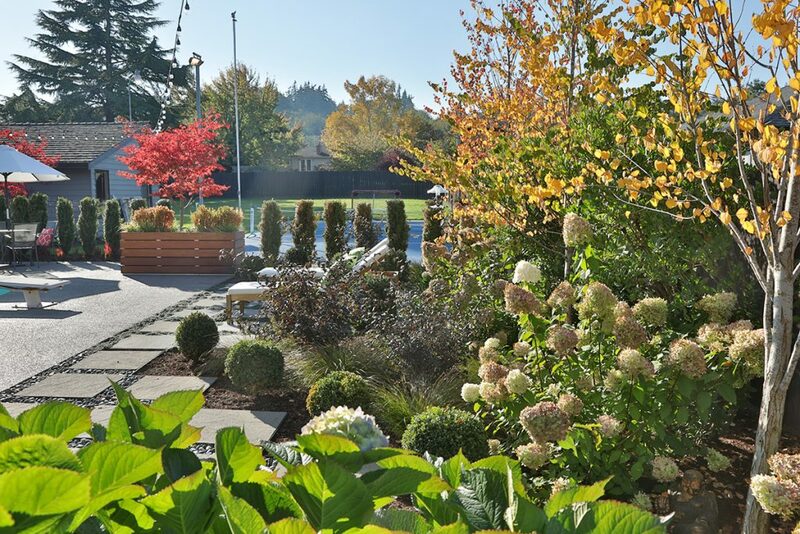 Whidbey Island garden design is still a passion of mine! 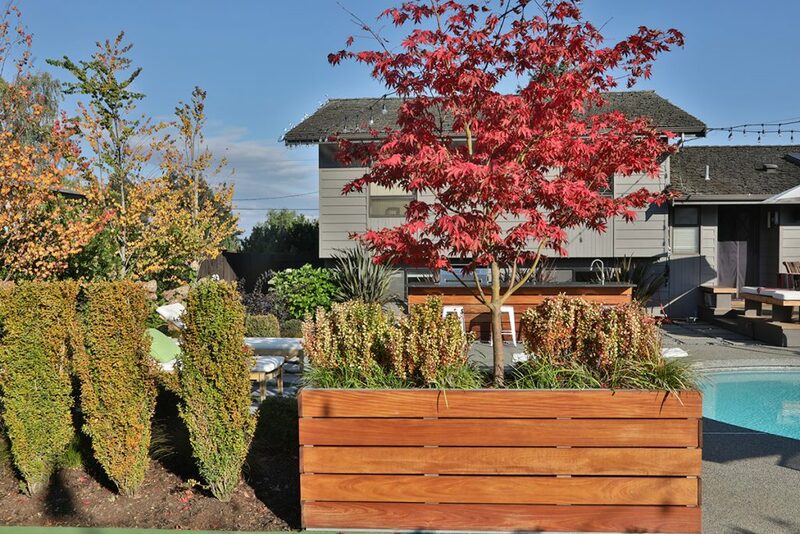 A spring or two ago I had the pleasure of collaborating with a great couple to help design their garden in Clinton on Whidbey Island. 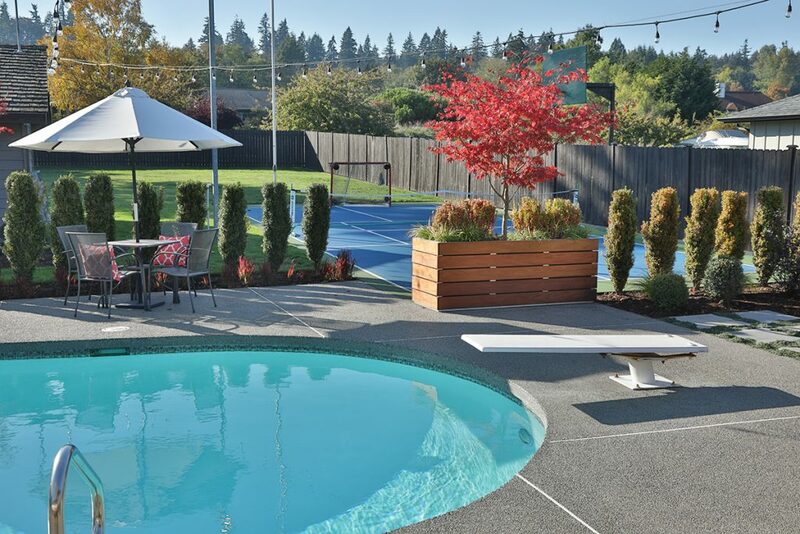 Their yard had lots of potential – and a pool! But it was wide open, had too much grass, and the bright blue sport court really dominated the “view”. Mark and Michelle own Miller Custom Construction. 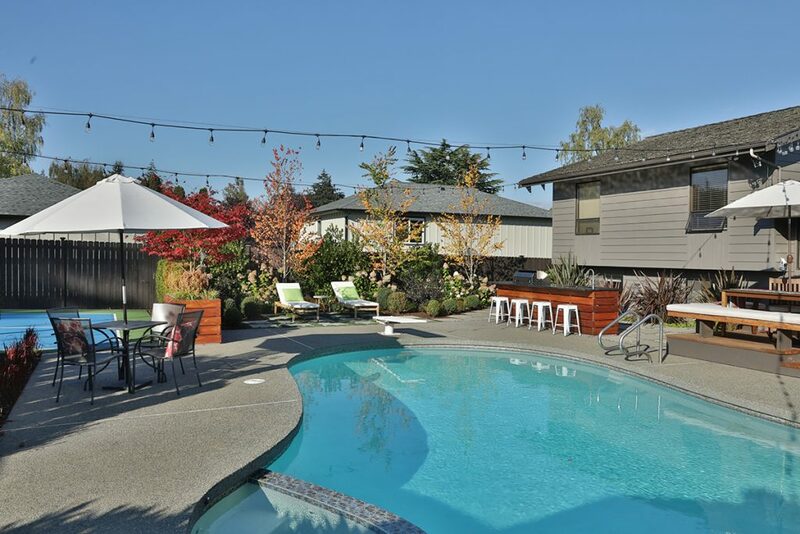 After building and helping to design so many homes, they had a firm grasp on their style. Their request for “softly modern” was squarely in my wheelhouse. 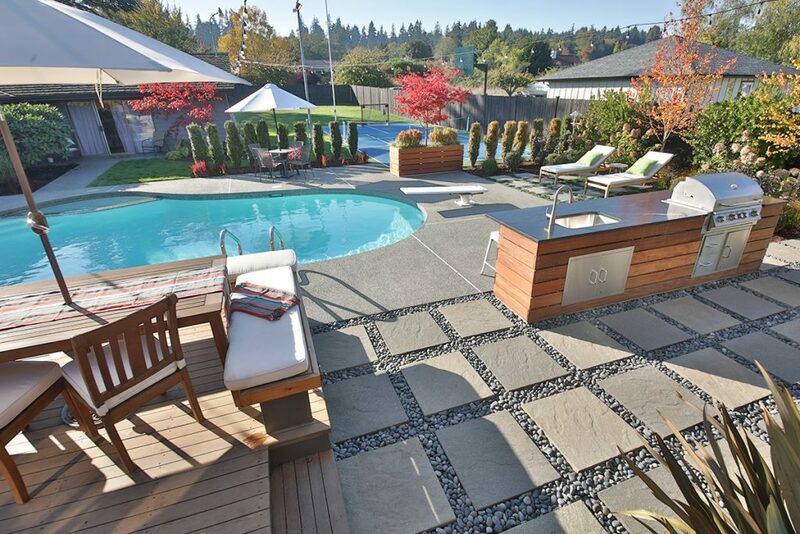 They knew they wanted an outdoor kitchen and shower (that he would design & build), and a little screening from a home being built next door. But how those elements went together, and what it all looked like, would be up to me. 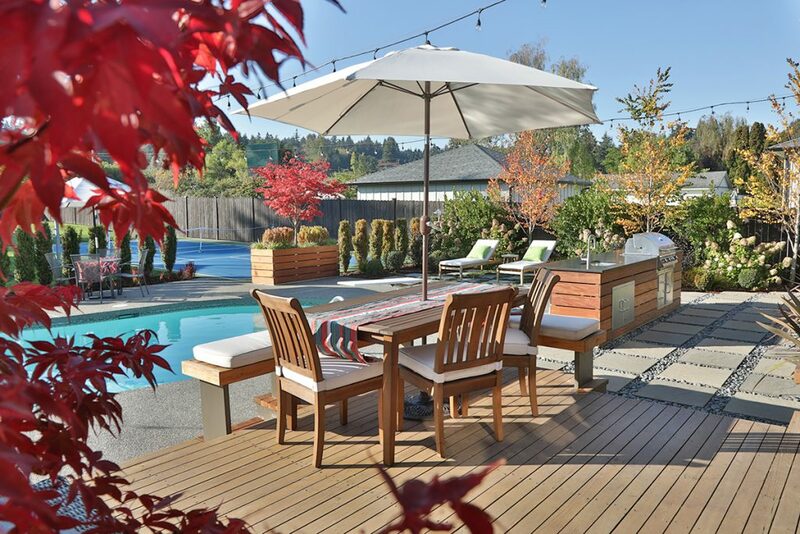 My design transformed the back yard from a sprawl into a series of spaces to gather and enjoy the resort-at-home atmosphere. Here’s the yard “before”. 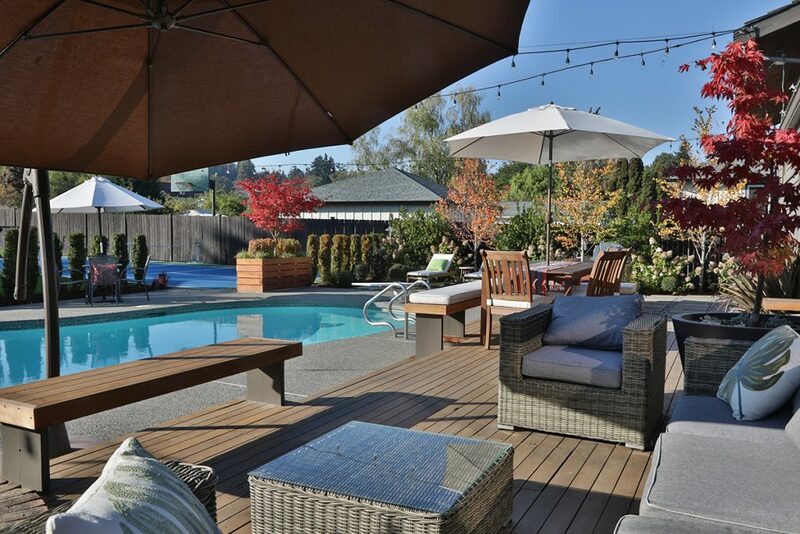 Not horrible – but… All seating happens either on the deck or the concrete, squeezing traffic around the pool. There aren’t enough spaces for all the socializing that wants to happen. There’s no great spot for a grill. There’s no privacy screening from the neighbors. And, that blue sport court… You just can’t stop seeing it. It hollers at you, “COME PLAY”, but there is nothing out there that beckons you to linger and enjoy. The eyeballs beg for a break from all that hard surface. 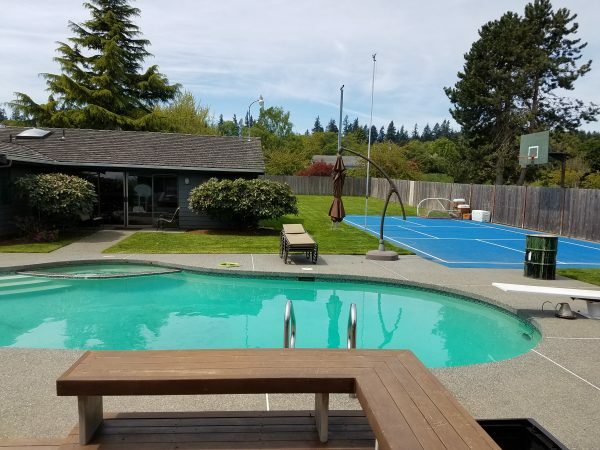 There’s no screening from the neighbors; the grass in the pavers is a pain to maintain; and the painted deck benches really hold the house in the 70s. Just a few changes make a big impact! This is a dynamic family home. There are athletic teenagers around here, so creating different spaces where kids could hang out with a little separation from parents seemed smart. I thought it would be nice to create a space to sunbathe or take an outdoor nap without getting splashed. We thought it would be great if the kitchen set-up could allow folks to hang out around the grill, so the cook could be in on the party. 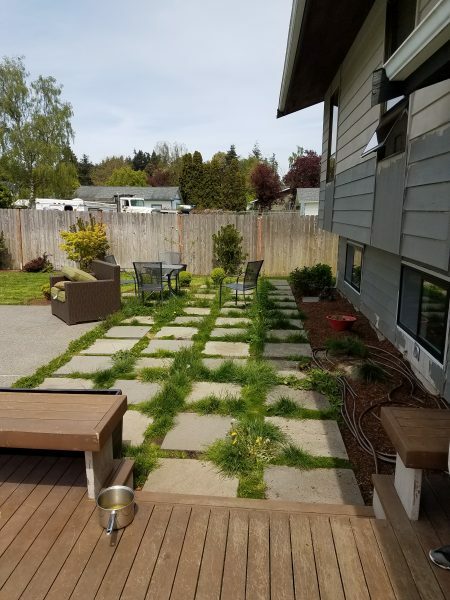 By removing some lawn that was patchy and problematic anyway, and rearranging some pavers, we were able to create a separate sitting area for sunbathing and splash-free lounging. We made the granite countertop on the kitchen generous enough to include a set of stools. Mark resurfaced the benches on the deck, and made a change to the paint color, to bring them out of the 70s. We used a strategically placed planter to gain some additional screening of the sport court where there wasn’t a place to put a bed. It would have been really difficult to remove the concrete there. 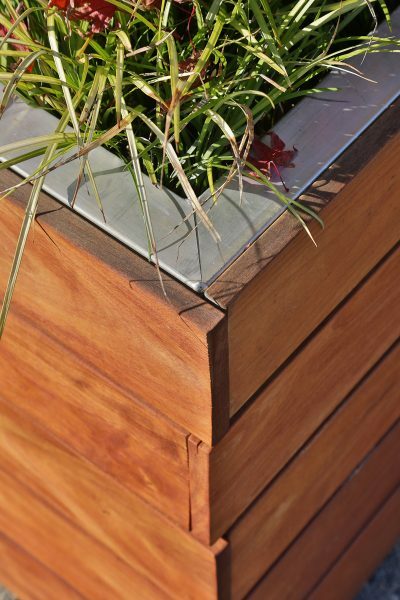 Instead, the planter provides the desired screening and offers a chance to tie in with the kitchen & shower details. 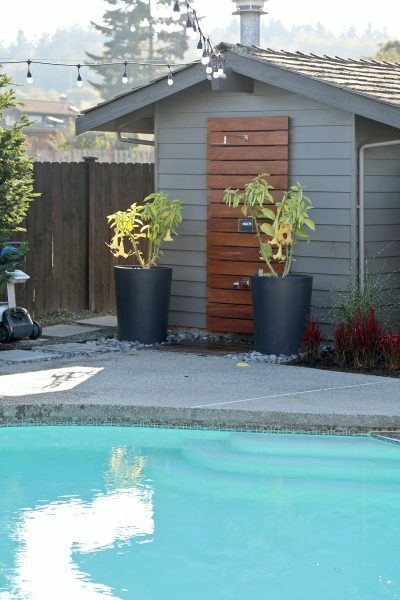 The planter, designed and built my Mark (along with the kitchen and shower), is fully lined and includes a drain that empties into the neighboring bed to prevent staining on the concrete. Mark can tell you a cool story of how he was able to salvage a bunch of aluminum from a friend’s scrap pile to build the frame – so resourceful! I love that he left face boards open enough for that peek of silver. Details matter! It seems that at almost every party I’ve gone to, the crowd is always in the kitchen. There is something about cooking that draws people in. 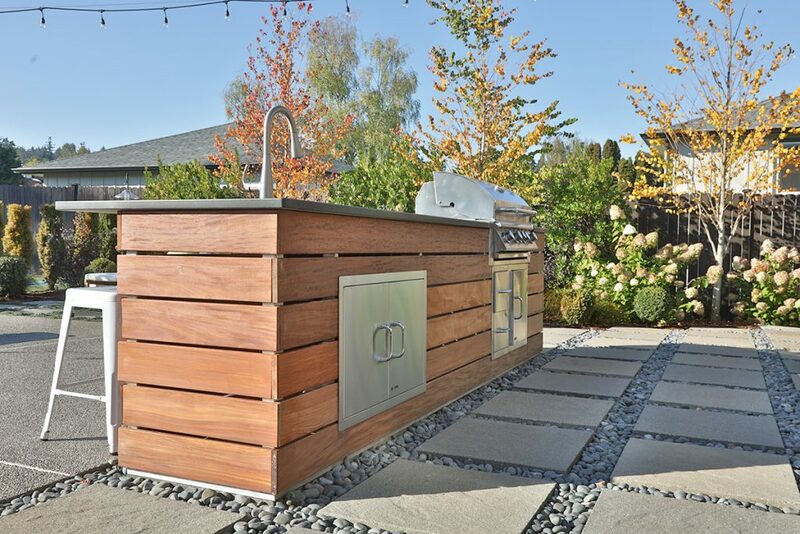 So instead of just having a place for a grill, Mark & Michelle knew they wanted that an outdoor kitchen would really make the space. We oversized the countertop, letting it hang over the patio a bit, to accommodate benches where people could gather and chat with the cook, or have a place to eat. A sink keeps things clean, and keeps wet bathing suits from having to go into the inside kitchen for a glass of water. A cabinet below offers a clean and weathertight place to store grill tools and equipment. 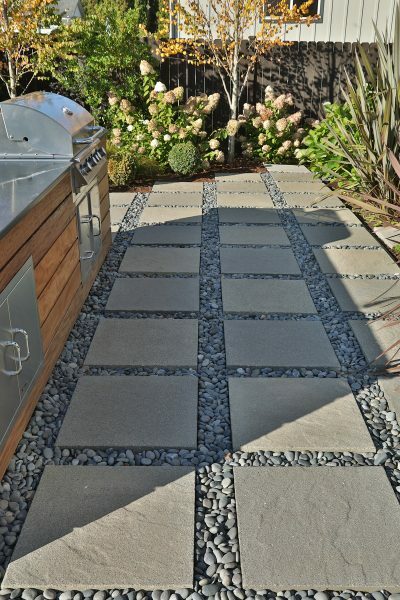 One thing we would do differently is chose a different color granite. 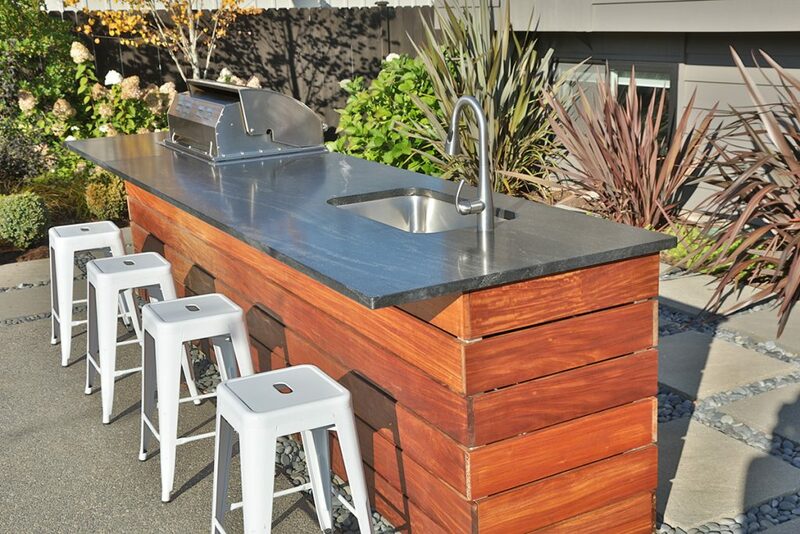 While the black doesn’t show the dust and dirt that accumulate in an outdoor kitchen, it does get pretty hot in the sun. After a dusty day on the construction site, or out for some exercise, it is so nice to simply rinse off outside and jump right in the pool. 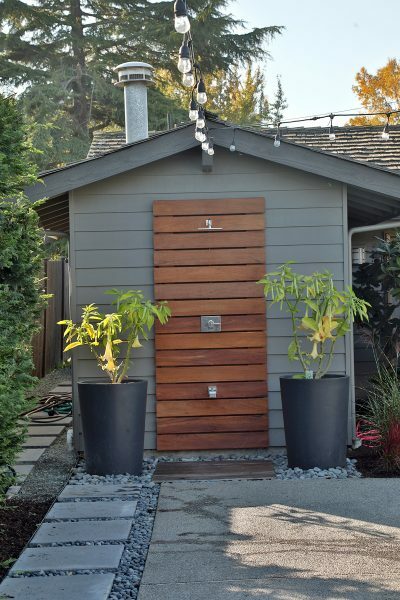 Mark built the custom shower, and I helped source some oversized pots to help create a feeling of a separate space. Michelle pots them up with tropical plants each year, to help create the feeling that you are somewhere in the tropics – even if for just a moment. This year it was Brugmansia aka Angel Trumpets. The hope was their intoxicating fragrance would fill the garden with scent – but Michelle is not in love with the plant. The plan for next year is to plant Papyrus. That’s the fun of pots – you can change them with each season if you like! 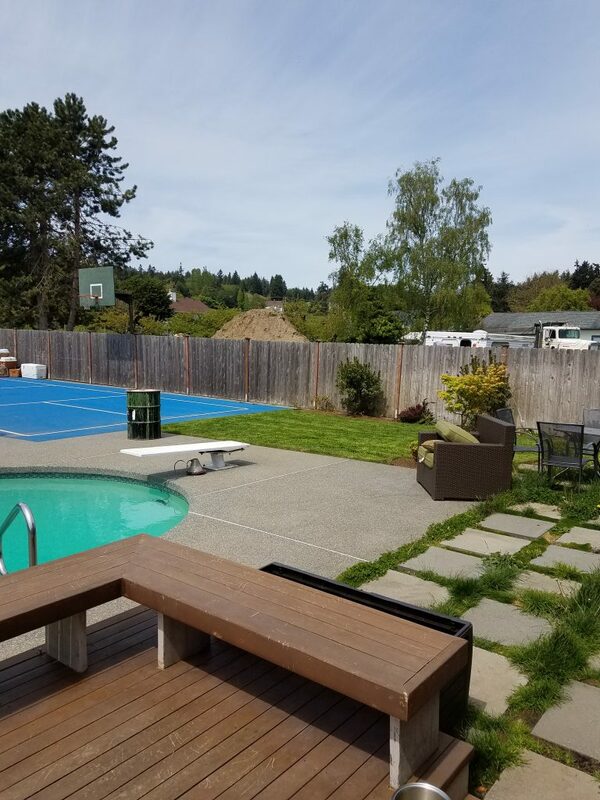 This yard has seen a lot of changes in just 2 years! The next step will be to finish the area around the poolhouse. We want to expand the entry and make a small seating area, and change the plantings there a bit. I think it is smart to break up garden projects into phases. It allows time to live with them and get things just right before moving on. If you would like some help with your garden, get in touch! Perhaps you are stumped by a few plants, or maybe you are thinking of bigger changes. Drop a line or give a ring – I’d be happy to help. Last, a big shout of thanks to Michael at Stadler Studio for these great photos!